Posted April 25th, 2012 by David Porter & filed under Technology. The Australian Trenton Oldfield was the man who disrupted the April 2012 Oxford and Cambridge Boat Race by swimming so close to the oars that the umpires halted the race. Oldfield was arrested and charged with a public order offence. He was protesting about elitism at the two universities, choosing to ignore that any competitive team in any arena is always going to put out its best team. But he has inadvertently also set alarm bells ringing about security at the London Olympic Games. Lord Moynihan, chairman of the British Olympic Association warned that just ‘one idiot’ could ruin the entire Games. For political reasons, protestors could sabotage any event and the resultant publicity would publicise their causes. Even the anger of sports lovers would boost these people’s egos. This summer over 10,000 Olympic athletes and their trainers will give their fingerprints and submit to their faces being scanned to make the Games more secure. 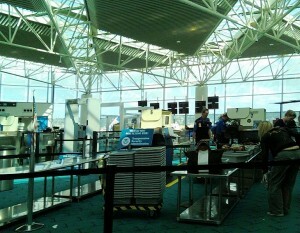 Many observers thought that biometrics had been tried, tested and found wanting at airports for some time. The UK Border Agency has found the iris recognition system (IRIS) to be too slow and cumbersome and has attracted some negative headlines and public opposition. Full body scans have met the same outcome, by and large. Even schools which have gone cashless for dinners and used the digital fingerprint method have not enjoyed success in public relations. These technologies are still in use and likely to remain so. IRIS will still be deployed at Heathrow and Gatwick till the autumn and facial recognition is being developed apace, not relying on full face exposures, but fragments to piece together a full identification. For the time being, a full panoply of measures also including passcodes, security keys, smartcards, and the humble password will be utilised together. IRIS is slow, but some data banks, such as Accenture, use it for clients to access their personal suites once inside the general/mass security screenings. Since 2004, some Japanese banks have added vein recognition in cash machines and over-the counter business, eliminating PINs altogether. India is at this moment generating 1.2 billion unique identifying numbers coupled with biometric data like retina scans, facial images and fingerprints (both actual and digitalised) to protect public services yet keep them accessible. Cloud-based authentification is of interest to businesses, according to Tracey Caldwell, writing in Business Technology (April 2012). She described BIO-key’s WEB-key client ‘which allows users to enrol on one device with a fingerprint reader and then authenticate on multiple devices and platforms’. With bring-your-own-devices (BYOD) to work becoming commonplace in the office, this sort of transferring will become essential. Caldwell also flagged up work being done to develop new protection. Keystroke and dynamic digital signature recognition can ‘support password entry by crosschecking what is typed in with the typing pattern of the password owner’. Everybody types in a unique way, employing different pressure on keys, speeding up with familiar words and making the same typo errors before correction. Also coming is ‘gait and movement’ recognition, or how people walk and talk. Again unique to each of us. People apparently also occupy a seat in a particular way, which can be logged to aid recognition. The extraction and analysis of DNA can only accelerate, and it remains a useful tool in the workshop of identity. Ears and noses are also personal, and can act as clues to who we are as individuals. Even facial features lying under the skin are being assessed for the ID purpose. Everybody’s heart beats to pump our lifeblood round, but they are all individual and can generate a mathematical pattern that could safely allow us access to a system. Our voices similarly can be broken down into patterns that can form part of an encryption key, even allowing for having a cold. All that ought to be reassuring and is in many ways. It just begs the question: what next once all the body parts are used, when the criminals catch up with that technology? Technology Is Not the Only Weapon on New Business Battlefield. Too Early to Face Pulling the PIN? Just How Valuable Is Your Web Data?